For commercial cleaning companies, it is vital that their team members understand the relevance and importance of the pH scale. This determines the acidity or alkalinity of a solution, and applies across a range of liquids, from water to battery acid! Obviously battery acid isn’t going to be a great product to use for cleaning, but it helps us to put into perspective the range of this sliding scale. 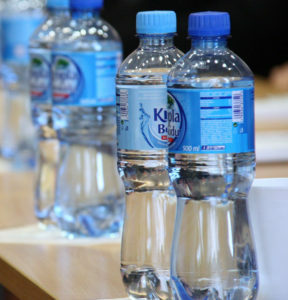 Generally the scale is measured from 0 to 14, with 7 being considered “neutral” – the only examples of which are purified water, or buffer liquids designed for calibration of pH meters. A solution which reads less than a 7 on the scale will be considered acidic. On the flipside of this, any liquid or solution greater than 7 is heading into alkaline territory. When it comes to cleaning chemicals, more acidic products are well suited to descaling operations, which alkaline being better for degreasing. Here are a few examples of pH levels in a range of items. As previously mentioned, any solution that falls below a neutral pH rating of 7 will have increased acidity. For commercial cleaning chemicals you will more than likely discover their usual pH level to sit anywhere between 0.5 and 5. Anything below a 0.5 is usually concentrated pure acids – NOT recommended for tackling anything! When a pH value of a product or solution decreases below 7, its acidity will start to increase. Most acid based cleaning materials will have a typical pH value of between 0.5 and 5 on the scale. Concentrated pure acids will have a pH value of approximately 0.1, though these would never be used as cleaning agents. Acidic products are most commonly used to remove limescale deposits from hard surfaces as they will dissolve salts that are not soluble in water, such as descalers. 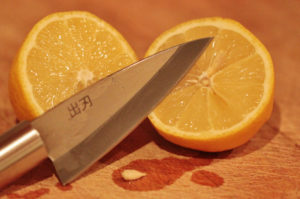 Your everyday lemons are a 2-3 on the Ph scale – more acidic than you think! A good example of alkaline cleaning products is Degreasers. As we have pointed out earlier, the pH of distilled water is 7 which is taken as being the purest neutral solution. However, in reality, any product or solution with a pH value of between 6 and 9 is generally considered to be neutral. Neutral products are commonly used for general cleaning procedures and include washing-up liquid and carpet cleaning solution. How is the pH Value Tested? 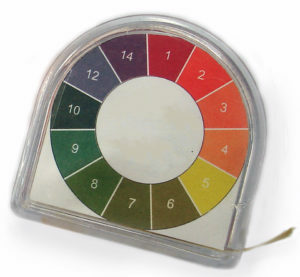 The approximate pH value of any liquid product or solution can be tested using Universal Indicator Paper, a type of litmus paper, which reacts to solutions and changes colour based on the pH level. This can then be compared with a chart, with the colour corresponding to the relevant value on the pH scale. Click the banners below to view our workwear and cleaning supplies websites.